Tetrahedron at Roe and Johnson Drive will be appraised as part of the project. Efforts to update Roeland Park’s art installations progressed this week as councilmembers gave preliminary approval to restore or relocate more than a dozen art pieces. The city is organizing its art collection in preparation for the $8.2 million Roe 2020 project, which will enhance the heavily traveled northern section of Roe Boulevard. The circular rock and metal structure located between 1-35 and West 47th Street known as “Scourge” and the half-moon at Roe and Johnson will be moved to the community center. Carpenter Park will acquire the metal sphere statute at the median north of West 47th Street known as “Ring Pop” while Sweeney Park will obtain the “Ballet Mechanique” located on the Roe and West 57th island. 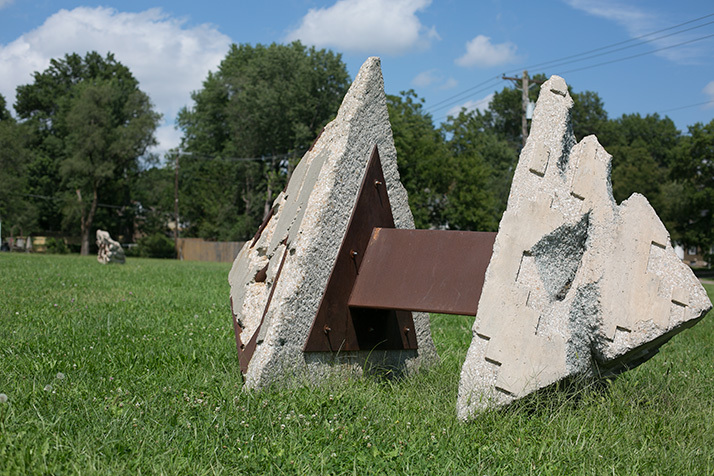 “Lines of Corona” currently located at the East cloverleaf at Roe and Johnson Drive will be moved to Nall Park. Remaining art pieces will be appraised, moved into public works storage, or moved to city hall. Councilmember Tom Madigan expressed some concern that art pieces with large amounts of rust like “Lines of Corona” would be moved to areas frequented by children. Councilmember Michael Poppa noted that these transitions were still tentative at this time and would need to go through the Parks Committee.